CRDI or common rail direct injection system is a method of injection of fuel into the engine cylinders of petrol and diesel engines.In the engines, a high pressure common rails used to inject the fuel in individual valves.In the modern generation engines this fuel injection system is used mostly because of technological advancement.In this method a common and single line is used to inject the fuel. This common line is connected to all the fuel injectors in the system, this common line is known as common rail. The difference between conventional injection method and CRDI is that in the conventional method the system needs to build the pressure again and again for every cycle of fuel injection process and CRDI is able to maintain the required pressure constantly for every cycle of injection i.e. CRDI will provide the same pressure in the common rail system. 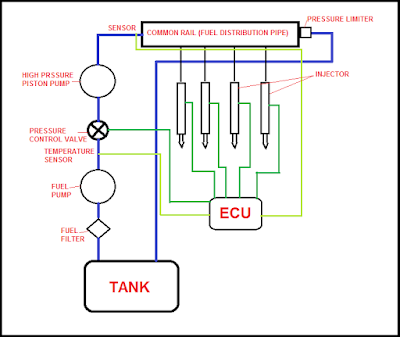 The ECU (electronic control unit) control the pressure as per the requirement. ECU uses sensors on the crankshaft and cam. The injection pressure is controlled or regulated on the factors like engine speed and load.The whole process makes the injection to be happened as per the requirement. It makes the system efficient, economical eco-friendly. Nowadays piezoelectric injectors are being used to get the higher pressure precisely. Robert Huber is the name behind initial development of CRDI. He developed its prototype in 60’s decade. Few more names come after him for the further development of this technology.After Robert Huber, Dr. Marco Ganser worked on it. In the 90’s decade this technology is used in the production vehicle in japan.The first public passenger vehicle with this technology is used in 1997 in model Alfa Romeo 156 2.4 JTD.This technology was used in the marines and engine locomotives for a period of time. The line diagram of CRDI shows that the system is controlled by ECU. 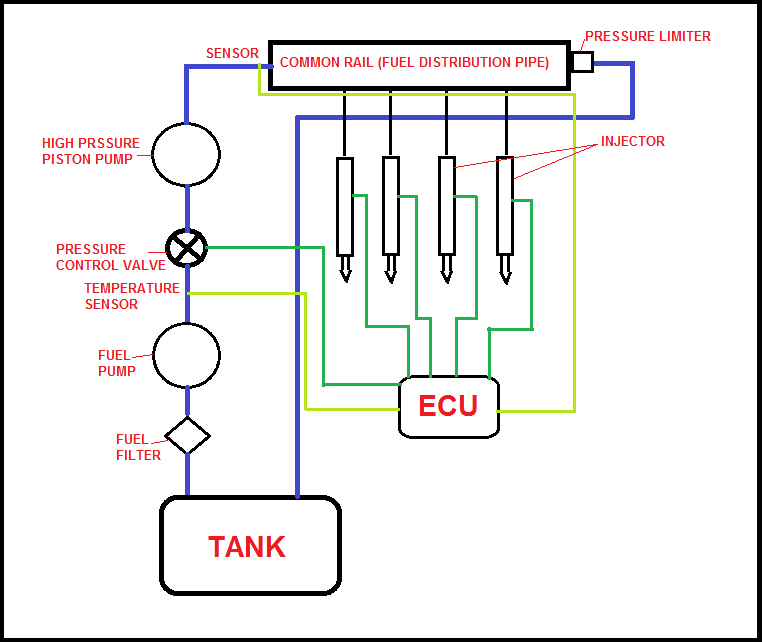 The sensors in the system are used to feed the input in the ECU.ECU will provide the signal to the injectors on the basis of engine factors like engine load, engine speed, temperature etc.The various components of engine will be controlled by sensors. The required quantity of fuel in required time will be calculated by it. In the system the advance solenoid fuel injectors will be used instead of using conventional injectors.In this system a common fuel distribution pipe is used to distribute the fuel evenly for all cylinders. That is why the system is called common rail system. This helps to maintain the pressure and the fuel can be stored here. So the supply and storage is maintained constant to the solenoid injectors by the common rail.In the modern engine with CRDI the injectors are used with turbocharger to increase the efficiency. It helps to reduce emissions and improves power output. In the process of CRDI a pump is used to pressurize the fuel. After the compression of fuel in the high pressure pump, the fuel is supplied to the common fuel rail. Then the fuel will be distributed to the different injectors. Injectors will finally inject the fuel in the engine cylinders. It has the ability to increase the power and torque of engine by 25%. It increases the power and efficiency and reduces the emission. It decrease the noise and vibration and provides improved pick up. It increase the fuel efficiency and decrease the fuel consumption i.e. mileage of the engine would be increased. This technology also have some cons as other technologies. Its cost of vehicles with this technology is high. This technology cannot be implemented in all type of engines. The cost of maintenance is also high because its spare parts are expensive. The CRDI technology is feasible with both petrol engine and diesel engine.As this technology is very useful, so most of the car manufacturer are using this technology now. And this technology has given a prominent benefits to the automobile industry.This technology can also be used in engine locomotives and marines.